The Things You Never Knew Existed catalog brings you a bevy of the best novelty gifts and gadget toys online, filled with things you never knew you could never live without! Things You Never Knew Existed - From sporty things to seasonal things, security based things to electronic gadgety things, the Things You Never Knew Existed catalog has something for everyone. Whether you're a prankster, a tech geek or a kid at heart, you'll find a wide range of unique novelty gifts that are guaranteed to elicit a wink and a smile. Wearable Things - Wear your humor on your sleeve and chest with a zany collection of 100% cotton tees available in a variety of hilarious themes. Things You Never Knew Existed also supplements your wardrobe with campy camp shirts, comfy lounge wear and accessories including belt buckles, novelty hats, glasses, wallets, bags, watches, jewelry and more odd accessories that will help you take a walk on the wild side. Novelty Things - Things You Never Knew Existed specializes in unique novelty gifts that they'll remember, from affordable 99 cent novelties to magic tricks, nostalgic decor to toys and games that will entertain their inner child. Elicit non-stop laughter with the best gag gifts featuring gags that shock, fart, prank, gross out and draw in. Collectible Things - No matter what you collect, Things You Never Knew Existed will help you complement your collection with collectible coins and currency, television and film memorabilia, classic die cast cars, trading cards, military inspired paraphernalia and more unique, collectible commodities. Seasonal Things - From scary Halloween things to festive and cheery Christmas-y things, the Things You Never Knew Existed catalog delivers a seasonal selection of holiday items that will keep you covered come October to the end of December. Stock up on the best Halloween costumes and masks, killer props and special effects as well as Christmas accessories and decor that will keep things jolly. As Seen on TV Things - We've all seen them and coveted them, the As Seen on TV treasures that promise to make life better. Find the things you never knew existed until you saw them As Seen on TV, with a collection that ranges from kitchen helpers to fitness gear and more infomercial essentials. 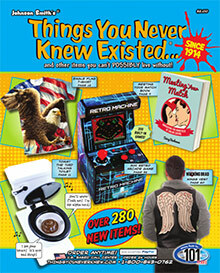 From sporty things to cheeky things, useful things to surveillance oriented things, you'll find the best gag gifts online and more of the coolest things in existence, featured only in the Things You Never Knew Existed catalog.